One of the most common purposes for our curing lamps is for surfboards. We have many customers using the lamps now, and have special lamps that are perfect for you, such as the Solacure SG1 FR71. It is a 6 foot, 100w light that can be used end to end for a total length of 12 foot. The SunHorse ballast can power 4 of these lamps for surfboard curing rigs with 8 or 16 lamps, depending on your needs. You can design your rig by overlapping the lamps, like in the image shown, or by placing them end to end to get the full length (must be tight to prevent a dead zone). This example is the minimum of 8 lamps. I know, it costs more for 16 lamps, but it is actually about 4 to 8 times faster to use 16 lamps. Not only do you get twice the lamps, but you can put the surfboard over twice as close, which makes as big a difference as anything. You CAN use 4 foot lights, end to end or perpendicular to the board, and just use a lot of them. Unless you are rolling them down an assembly line, this probably isn't the best solution. One advantage of the 6 foot lamps is that they are not just longer, but T12 (1.5" thick) and capable of producing a lot more UV per foot than a 4 foot lamp. They also have better heat dissipation and a longer life, so while you may spend a little more time with the initial setup, they are actually cheaper to operate and require half the maintenance. There are a couple of ways that I've seen for creating surfboard rigs, and surely plenty more if you think about it. The most common way is to build a frame out of 2x4 boards, mount the lamps and ballasts to it, then suspend this from thin chain. Then you take your work table (on casters) and put it under the rig. You can combine your ballasts down to a single cord, and you just have to have power to that one cord. 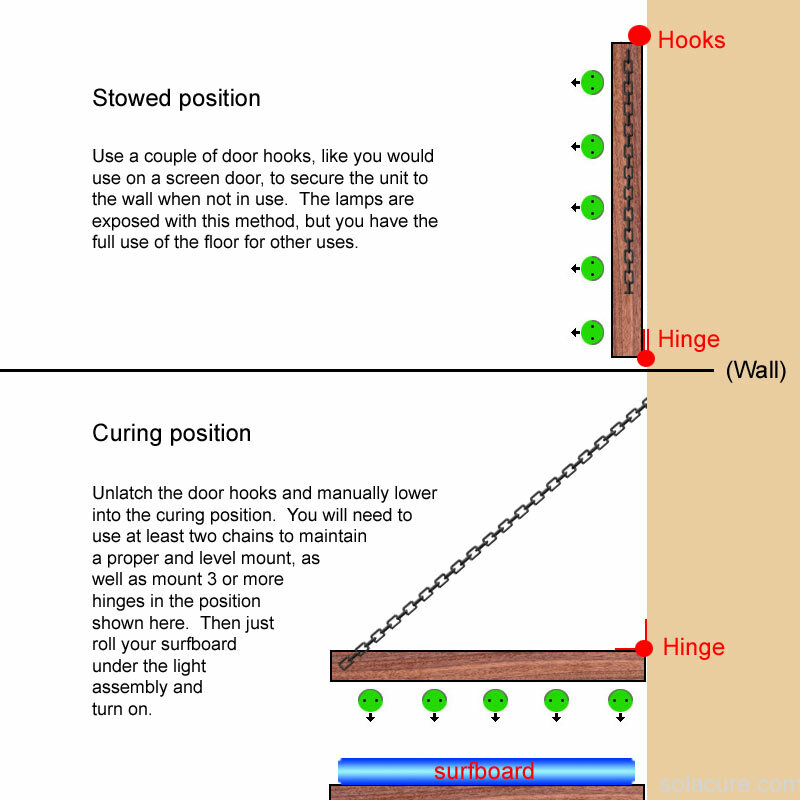 Another way is to build the same frame as above, say 12 foot long by 3 foot wide, but mount it on hinges against the wall, so it can be upright when not in use, then lowered down and held level to the floor when in use. I would suggest using a door hinge every 3 feet. When building like this, you are better off using lighter materials where you can, so instead of using thick OSB on the face of the frame, I would suggest using something like 1/4" plywood. A bit more expensive but worth it as it will reduce the weight. You can also use 2x2" cross members if you predrill the holes for screws. You should ALWAYS have the lamp ends mounted into a 2x2 or 2x4, not just the facing wood. Here is an example of what I'm talking about. This method works for a lot more than surfboards, and for any size rig where space is a premium and you want to be able to stow the unit out of the way when it isn't in use. Obviously, if you do a lot of curing during the day, this would probably be more trouble than it is worth, and a dedicated curing station is justified.